With more and more attention being paid to postal notices of all types in that they provide another factor of information about postal history. While not exactly earth shattering, the postal notice shown in the picture above dates from 1868 and is the same form as used for domestic letters and registered international letters. The imprint instructions, etc. 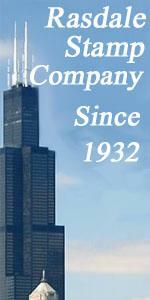 show it was for use by the New York City post offi ces and identified as authorized by James Kelly, P.M. The notice has the printed year date of 1867 which was corrected by hand to read 1868 with a registered number which was corrected from 175 to 178. Without any detailed information as to postage and registration fee for the letter from New York City to Ireland marked on the postal notice the following can be presumed. Since the international registration fee in 1868 was the same as the fee for a domestic letter which cost 20c. It has also been noted that the fee was to be paid by using 20c in postage stamps. Sol the letter had stamps on it for postage as well as the registration fee. In 1868 the U.S. and Great Britain postal treaty rate for the ½ oz. letter from the U.S. was 12c. So the minimum cost of mailing the registered letter was 32c. With any additional ½ ounces as 12c. Having looked at the postal history aspects of the related information pertaining to the mailing of a registered letter from New York City to Ireland (Great Britain) in 1868 a rather subtle but tantalizing set of questions remain. What did John McCerren send to Sarah McCerren in the letter that he felt required it to be registered? Was Sarah his wife, mother or sister? Was he sending valuable papers about coming to America that he felt could not be trusted to the ordinary mails and to ordinary postal clerks? Another question, if so unsure as to its arrival did he also send a 2nd letter requesting an answer to show the registered letter had been received? Of course all of this could be answered if the original letter with its contents had been saved by Sarah as John did with the postal notice. With the finding probability factor for the letter below zero, we can only thank John McCerran for at least saving his end of the mailing. 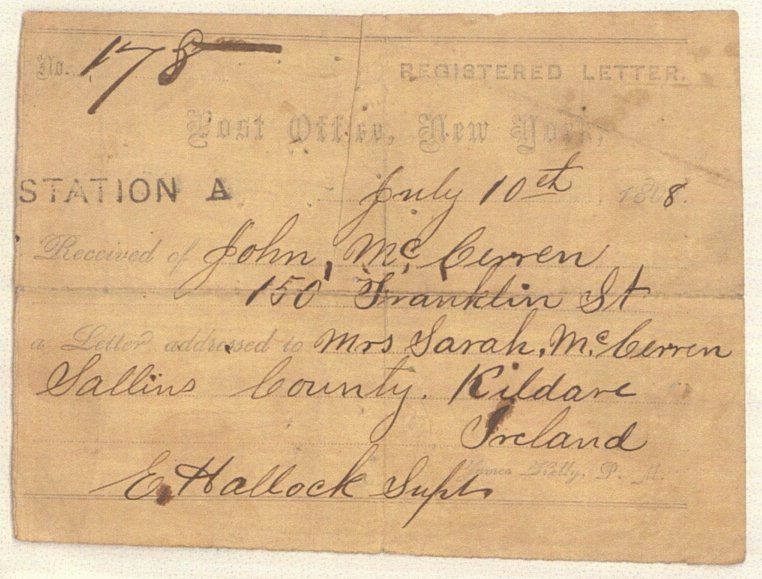 Thus providing a really nice example of a postal notice used for an international registered letter going from New York City to Ireland in 1868 that makes for a great postal history collectible.